It might be downhill for me from now on but what’s good for the Jill Y is good for the Bill Y. Shopping is kind of like a way of purchasing stuff. Jill Y likes shopping. Have I been known to hire multiple, independent contractors with specialist training with the sole aim of stopping her finding where I hid the credit cards? Yes, I have. Has it worked? No, it has not. Where shoes are for sale, Jill Y can be found and that’s just the way it is, so get over it already. I decided to look into this shopping thing for myself and guess what? They have all sorts of things for sale. 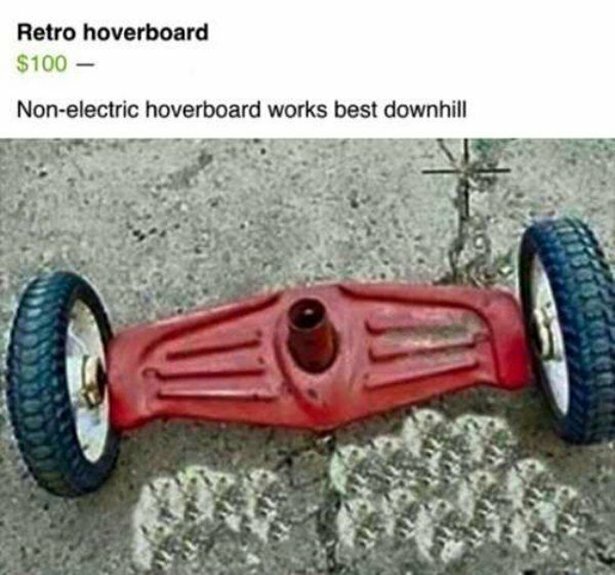 I’ve always wanted a hoverboard and now I want one, no more. 10 Responses to It might be downhill for me from now on but what’s good for the Jill Y is good for the Bill Y.
I think that’s the thing that broke off my 1952 reel lawnmower. And Bill Y once more, inadvertently opens up more wounds! That looks like my old bicycle. This reminds me: I have a retro motorless motorcycle that I’d like to peddle for $5000. We buy and sell and buy and sell. It’s a vicious cycle. That looks like an old yard weedwacker. At least you can get the grass done and read the paper hands free. That is, until a rock gets ya. Only on HO can you meet such positive people. Back to The Future has that effect on me.